As four teams prepare to play in the conference finals the rest of the teams get their first look at what is in store for the upcoming offseason. 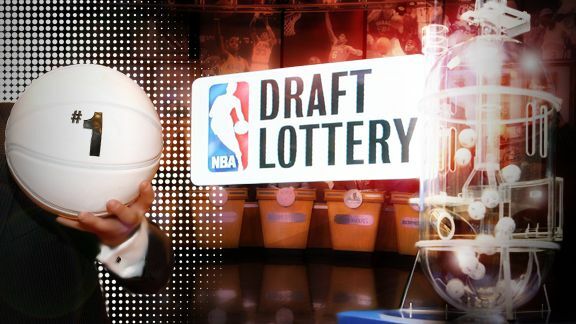 The NBA Draft Lottery is being held tonight (8:30 p.m. ET, ESPN) and the 14 teams who did not make the playoffs get their moment in the spotlight. The Lottery is a flawed system that directly rewards teams for being bad, but still has so much intrigue. Especially this year as the Philadelphia Tankers Sixers can end up with one, two or three top-14 picks in this year’s draft. The Sixers have their own first round pick, get the Lakers first round pick if it falls out of the top-5 (as part of the Steve Nash trade between L.A. and Phoenix, which then Phoenix traded to Philly as part of Michael Carter Williams deal), and could end up with the Miami Heat’s pick if it ends up outside the top 10 (as part of the Kevin Love, Andrew Wiggins, Thaddeus Young switcheroo). Each team will be represented by a notable person at the draft lottery and this year’s dais makes me want to watch what kind of shenanigans are going to happen. You’re telling me you do not want to watch what is going to happen between Russell Westbrook, Larry Bird, and Vlade Divac if one of their teams jumps way up in the draft? What will Westbrook will wearing? Will Vlade be smoking on the dais? All legitimate questions that will be answered tonight on live television. The NBA Draft lottery has been in place since 1985, ultimately deciding which bad teams get the right to pick first. Prior to that a coin flip between the two teams with the worst record was used and the rest of the draft was ordered by record. For the 14 teams who have a chance to win the first overall pick tonight is their organization and fan’s Christmas Day (follow me on this one). As the envelops are opened some teams “wake up” finding their prayers were answered, having secured a top-3 pick when their name is not called. Others who desperately need the top pick can find themselves in a comparable situation to their sibling taking the present they asked for right out of their stocking. This is the type of real-life drama people craved and continue to thrive off of, just as people enjoy watching as the drama unfolds at the draft itself. The drama that will almost definitely be present tonight will involved the Minnesota Timberwolves, the team with the best odds to get the first pick, not actually get the first pick. This exact flaw in the system has led many people (like ESPN’s Amin Elhassan) to desire a new way of introducing rookies to the league. Elhassan’s proposal does not include a draft at all, and actually kind of makes sense. The current system rewards failure and giving teams a certain amount of money to spend instead of draft picks allows the rookies to decide where they want to play. I wrote last offseason I liked the wheel proposal, which would make things much more interesting. Since the lottery must go the question becomes who will end executing their losing strategy to perfection and get to select first overall? Will it be the New York Knicks, who kicked off the NBA Draft Lottery era by selecting Patrick Ewing in the mid 80s? Will it be the Sixers, who could walk away from tonight’s lottery with a best case scenario of picking first, sixth and eleventh (that’s called the Hinke effect). Will it be the Los Angeles Lakers, who could end up with the first pick, no pick in the lottery at all, or somewhere in between? Or will another team come from the back of the pack, pass everyone (there’s some horse racing lingo for ya) and defy the odds to win the NBA’s version of the Triple Crown? Once the lottery is complete the countdown begins to the actual draft itself. There will be a little over a month for a teams to decide which prospect in a pretty top heavy draft they want to select at the end of June. Not to mention in this time the Conference Finals and NBA Finals will be going on as a reminder that good teams do still currently exist in the league. The Draft Lottery is a half hour of made-for-television drama that I simply cannot get enough of. Sure, it’s just people holding (and sometimes opening) envelops, but it’s what happens as the envelops are being opened that’s the entertaining part. *The NBA Draft will take place on June 25 at 7 p.m. ET. Stay tuned for many Mock Drafts, and a fan-compiled mock draft that you could be a part of! This entry was posted in Draft / Offseason, Home, NBA, NCAA and tagged 1985 NBA Draft, 2015 NBA Draft, 2015 NBA Draft Lottery, Amin Elhassan, Deflate Gate, DeflateGate, draft lottery, ESPN, Los Angeles Lakers, Lottery, NBA, NBA Draft, NBA Draft Lottery, New York Knicks, Philadelphia 76ers, Ping Pong Balls, Russell Westbrook, Sixers, Vlade Divac, Zach Lowe, ZML. Bookmark the permalink.